Peas, beans and other members of the legume family of plants can form friendly relationships (symbioses) with nitrogen fixing bacteria from the soil. Guided by the plant, the bacteria infect into the root and colonise plant organs called nodules, which supply sugars to the bacteria. Nodules also provide conditions that enable the bacteria to efficiently convert nitrogen gas (N2) into a form of nitrogen that plants can use to grow. To set up a symbiosis, the plant and bacteria exchange signals to enable them to identify each other. The plants release molecules called flavonoids into the soil and, in return, the nitrogen-fixing bacteria produce molecules called Nod factors. These Nod factors activate signalling pathways that trigger many responses in the plant and allow the bacteria to enter. The bacteria need to produce the correct Nod factors to gain admittance and so most legumes are only able to team up with a few species of bacteria. Other bacterial molecules such as exopolysaccharides also play important roles in establishing the symbioses. Although legumes choose their symbiotic partners carefully, other bacteria known as endophytes are able to infect and colonise nodules. Since these endophytic bacteria do not fix nitrogen, they do not appear to be beneficial to the plant and may take up room that could be filled with nitrogen fixing bacteria. However, we do not know exactly how the endophytes are able to gain access to the root. In a paper published in PLOS Genetics earlier this year, a group of researchers led by Simona Radutoiu at Aarhus University, Denmark investigated how endophytic bacteria infect the nodules of a legume called Lotus japonicas (Zgadzaj et al. 2015). The researchers exposed the plants to a nitrogen-fixing bacterium called Mesorhizobium loti – which is able to form symbioses with L. japonicas – and a species of endophytic bacteria called Rhizobium mesoninicum strain KAW12. Zgadzaj et al. found that R. mesonicum KAW12 alone is not able to induce the formation of nodules on L. japonicas. However, it is able to infect the nodules that form on the plant in the presence of M. loti. 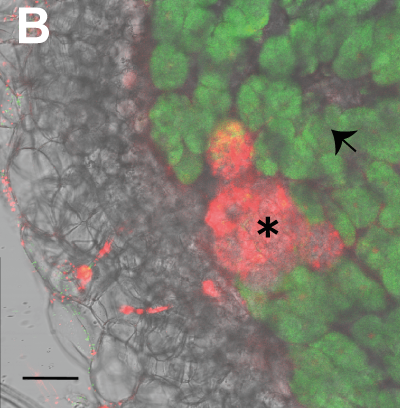 In these nodules, the nitrogen-fixing bacterium occupied most of the space, while the endophytic R. mesonicum KAW12 was confined to small areas. Further experiments showed that the ability of the endophyte to colonise the nodules depends on the signaling pathways in the plant that are triggered by Nod factors from the nitrogen-fixing bacterium. Although the R. mesonicum KAW12 does not produce Nod factors, it does produce exopolysaccharides that might be recognized by the plant. Zgadzaj et al. found that exopolysaccharides produced by the endophyte promote its infection into nodules, while exopolysaccharides produced by the nitrogen-fixing bacterium restricted it. Researchers have access to many different L. japonicus mutant plants that have defects in genes that control various stages of infection by nitrogen-fixing bacteria. The researchers used these plants to show that some of these genes also regulate which endophytic bacteria can enter the nodule. Together, Zgadzaj et al.’s work demonstrates that legumes selectively regulate both the nitrogen-fixing and endophytic bacteria that are able to enter the nodule. In the field, symbioses between legume crop plants and nitrogen-fixing bacteria are often not as efficient as they could be, which can limit the growth of the plants. Therefore, these findings may aid efforts to improve the yields of legume crops in the future. I really enjoyed this post! Do you have any idea how the non-nodulating legumes form these relationships? For example, I know Gleditsia triacanthos (Honey Locust) has been proven to fix nitrogen despite having no nodules. I can point you to a few studies if need be as I’ve lost my free university library since graduating. I would be very interested in seeing that study myself if you’d care to share. I suppose this is a relatively new study? Absolutely! As I mentioned I lost my access to get past the paywall of many sources, but I can at least point you to the studies. Bryan, James A. 1995. Leguminous Trees with Edible Beans, with Indications of a Rhizobial Symbiosis in Non-Nodulating Legumes. Doctoral Dissertation, Yale University. Next, I no longer have access to this study, but if my memory serves correctly the researchers found that honey locust trees contained more nitrogen in their seeds and leaves than their growing medium could provide alone. I remember the researchers noted higher nitrogen levels in plant tissues than even the nodulating legumes growing in the same soil medium. I know of at least one more, but it is behind a $300 paywall. I hope those two are enough to get you started! I have only an amateur passion in botany as I studied forest ecology just for fun in college. I love learning about the science of plants so thank you for all the information you provide! Thanks so much! I will start picking away at these and any related studies these turn up. I really appreciate it. Daniel: In this case, the endophytic bacteria enter the plant along structures called infection threads that are induced by the nitrogen-fixing bacteria. The exopolysaccharides produced by the bacteria are important: infection threads induced by a mutant nitrogen fixing bacterium that does not produce EPS abort before they reach the nodule, but endophytic bacteria can rescue these infection threads to allow the bacteria to enter the nodule. Since the endophytic bacteria don’t appear to have a benefit for the plant, their ability to enter the plant may be a side effect of the way that the plants select their nitrogen-fixing bacteria. Nod factors, EPS and other signal molecules called lipopolysaccharides are not directly connected to the nitrogen-fixing ability of the plant. Therefore, other bacteria that produce some/all these molecules may be able to trick the plant into believing they are nitrogen-fixing bacteria.